It's easy for your business to look not-so-credible online. That starts with your website. Since people will judge how credible your company is within 3 seconds of seeing your website, the first image/page that loads should be stellar. People need to know that your site is worth their time, and there are a few dead giveaways. With the amount of crappy website templates out there, and the excess of companies setting bad examples, it's easy to have a website that is hard to enjoy, let alone look professional. Since the wellness movement is only recently picking up this big momentum, there are a lot of beginner sites out there. Do your best to not emulate them. Here, I'll show you some quick wins for making your site look more professional, credible, and easy-to-read. 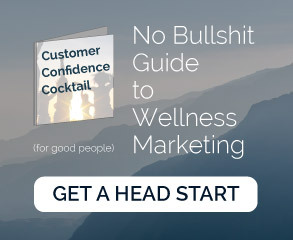 If you want to make your site feel extremely credible and unique, then get yourself a passionate web designer who has an interest in wellness. This is the holy grail of reading-friendly typography. It is the vertical space between lines. You'll notice that most easy-to-read books have large spaces between each line. Adding space here makes the text feel less cramped, and makes your readers feel less rushed. If you have a wellness brand, you need to make your customers feel comfortable. You need to make them trust you. Increasing line-spacing will help with that. This has a similar effect as the line-spacing. It makes your text easier to read and creates more space. This is something that may only work with certain fonts. To experiment with it and figure out where it works. Often, it looks very nice with bigger fonts. The higher px, the bigger the space. See how negative space above and below this line helps it stand out? It also makes the page flow nicer. The most common issue you may have with with getting your site to feel spacious and comfortable is the lack of negative space. You may want to cram as many words and icons on your web pages as possible, but when it comes to communication, less is more. Try adding some extra space after each paragraph, and more space before and after images on your website or articles. Your reader's eyes will thank you. What can you do to replicate this on your website? Here are some links to show you how to do what I explained above. Send these to your web designer.